Last week I already did a post about a new task sequence variable and this week my post will be about another new task sequence variable. This one will probably be used a little less, but can be very useful in some specific situations. Think about situations where an action needs to be performed directly after the task sequence is finished, without impacting the status of the task sequence. In this post I will use a situation where I want the machine to shutdown at the end of the task sequence, as an example. Open a task sequence in the Task Sequence Editor. 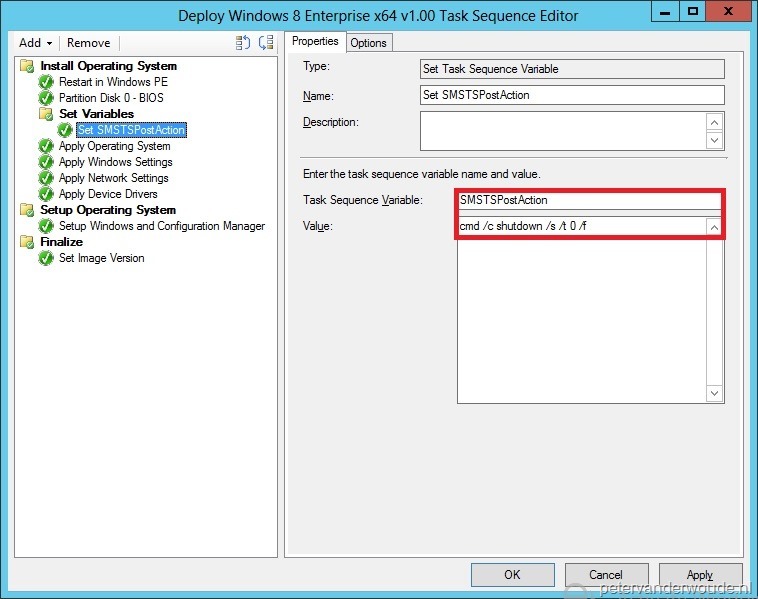 Add a Set Task Sequence Variable –step to the task sequence. Fill in as Task Sequence Variable SMSTSPostAction and, in this example, as Value cmd /c shutdown /s /t 0 /f. Close the Task Sequence Editor. Normally adding a shutdown action to a task sequence would cause the task sequence to fail, but now the task sequence will first end successfully and then it will perform the shutdown. A look at the deployment status will show this result. And of course I can show a screenshot of that or of a turned off machine, but I think the SMSTS.log will show some more useful information. As the SMSTS.log will also log the post action. Keep in mind that the SMSTS.log will register the action, but does not register a success or failure of the action. but still nothing is executed at the end of the task sequence. The TS is exiting with status Installed, so the error is not in the TS. Do you have any suggestion? My SCCM 2012 R2 environment is version 5.00.7958.100. Which should support this variable isn’t it? Yes, I’ve tested this myself and yes, it should still be available in ConfigMgr 2012 R2. When it’s working properly, the smsts.log should show information about an End program that’s being set. Great to hear that you already found your answer. Thanks for sharing your solution! For some unclear reason it’s not running (SCCM 2012 SP2) , I’m not sure whether the executionpolicy is necessary or not. In the smsts.log I see that the script is executed, but obviously no returncode is recorded. The smsts.log will only log the fact that it configured the action. To test the command, I would advise to first test it in SYSTEM context. It would be interesting to know, if it’s possible to use other task sequence variables in the post action. I haven’t tested that, but as the action is set by the task sequence I can imagine that it should be possible. Should be easy to test though. Is it possible to have multiple Post actions? Only when you start those actions via the same script. Provide your email address to subscribe to updates on this blog. 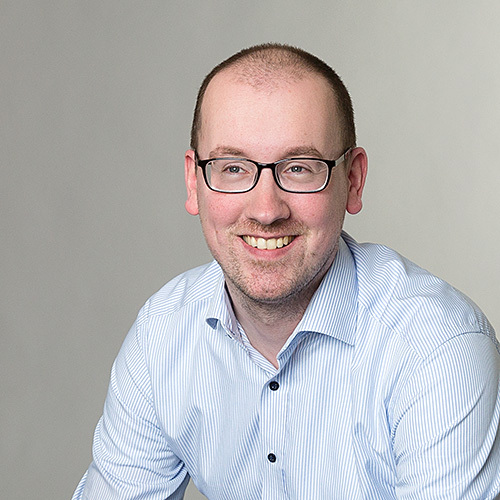 I’m Peter van der Woude, born in 1983 and I’m living together with my wife and two sons in the Netherlands. Currently I work for KPN ICT Consulting. At this moment my main focus is Enterprise Client Management via Microsoft Intune and/ or System Center Configuration Manager (ConfigMgr 2007/ 2012/ CB) and I love it!